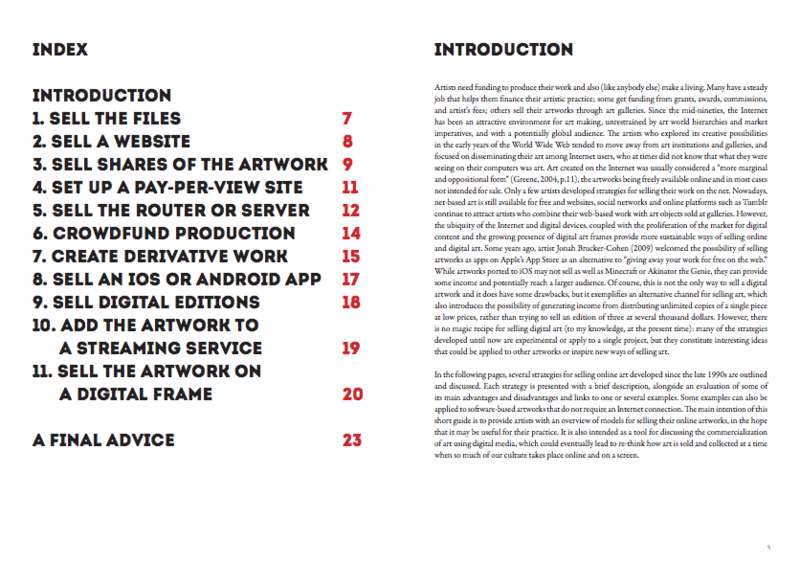 This is a short guide for artists in the form of a PDF (23 pages) that I wrote for Glimpsedome, the digital thought pavillion curated by Andreu Belsunces at The Wrong New Digital Art Biennale in 2015. Artists need funding to produce their work and also (like anybody else) make a living. Many have a steady job that helps them finance their artistic practice; some get funding from grants, awards, commissions, and artist’s fees; others sell their artworks through art galleries. Since the mid-nineties, the Internet has been an attractive environment for art making, unrestrained by art world hierarchies and market imperatives, and with a potentially global audience. The artists who explored its creative possibilities in the early years of the World Wide Web tended to move away from art institutions and galleries, and focused on disseminating their art among Internet users, who at times did not know that what they were seeing on their computers was art. Art created on the Internet was usually considered a “more marginal and oppositional form” (Greene, 2004, p.11), the artworks being freely available online and in most cases not intended for sale. Only a few artists developed strategies for selling their work on the net. Nowadays, net-based art is still available for free and websites, social networks and online platforms such as Tumblr continue to attract artists who combine their web-based work with art objects sold at galleries. However, the ubiquity of the Internet and digital devices, coupled with the proliferation of the market for digital content and the growing presence of digital art frames provide more sustainable ways of selling online and digital art. Some years ago, artist Jonah Brucker-Cohen (2009) welcomed the possibility of selling artworks as apps on Apple’s App Store as an alternative to “giving away your work for free on the web.” While artworks ported to iOS may not sell as well as Minecraft or Akinator the Genie, they can provide some income and potentially reach a larger audience. Of course, this is not the only way to sell a digital artwork and it does have some drawbacks, but it exemplifies an alternative channel for selling art, which also introduces the possibility of generating income from distributing unlimited copies of a single piece at low prices, rather than trying to sell an edition of three at several thousand dollars. However, there is no magic recipe for selling digital art (to my knowledge, at the present time): many of the strategies developed until now are experimental or apply to a single project, but they constitute interesting ideas that could be applied to other artworks or inspire new ways of selling art. 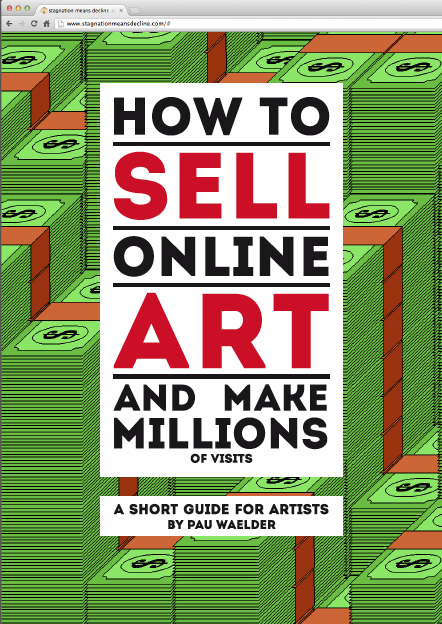 In the following pages, several strategies for selling online art developed since the late 1990s are outlined and discussed. Each strategy is presented with a brief description, alongside an evaluation of some of its main advantages and disadvantages and links to one or several examples. 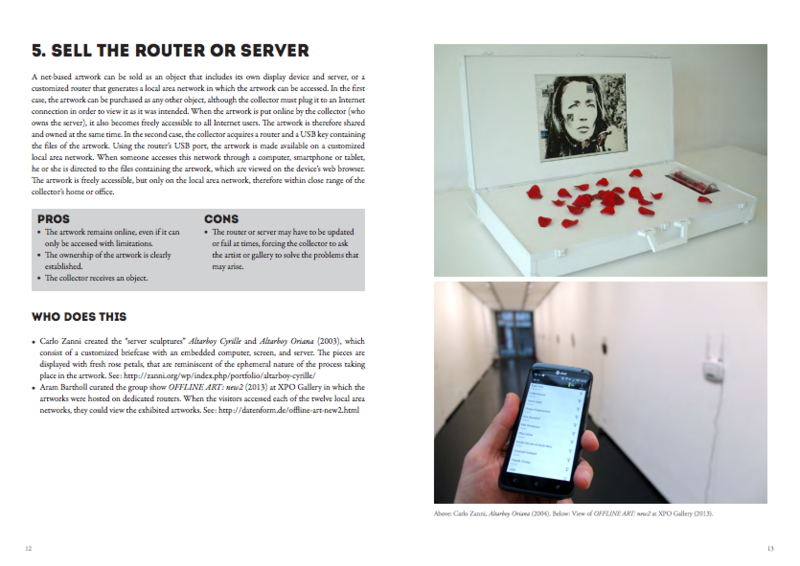 Some examples can also be applied to software-based artworks that do not require an Internet connection. 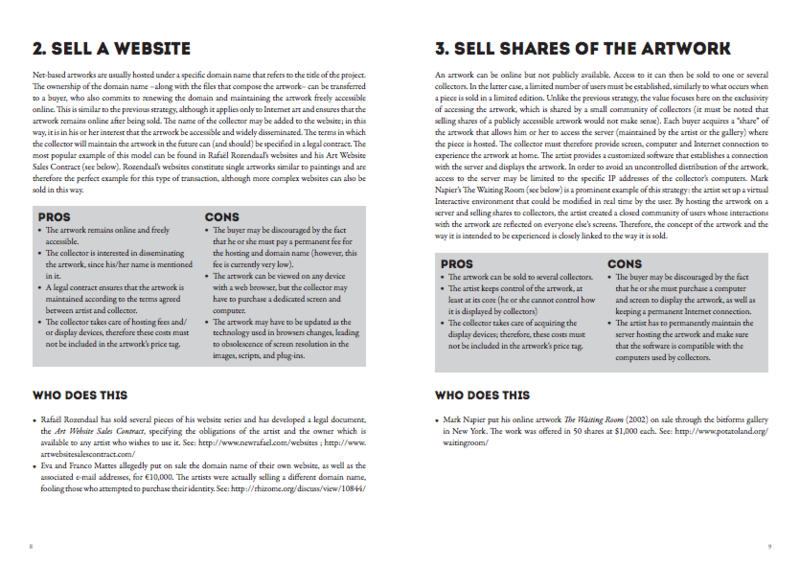 The main intention of this short guide is to provide artists with an overview of models for selling their online artworks, in the hope that it may be useful for their practice. It is also intended as a tool for discussing the commercialization of art using digital media, which could eventually lead to re-think how art is sold and collected at a time when so much of our culture takes place online and on a screen.